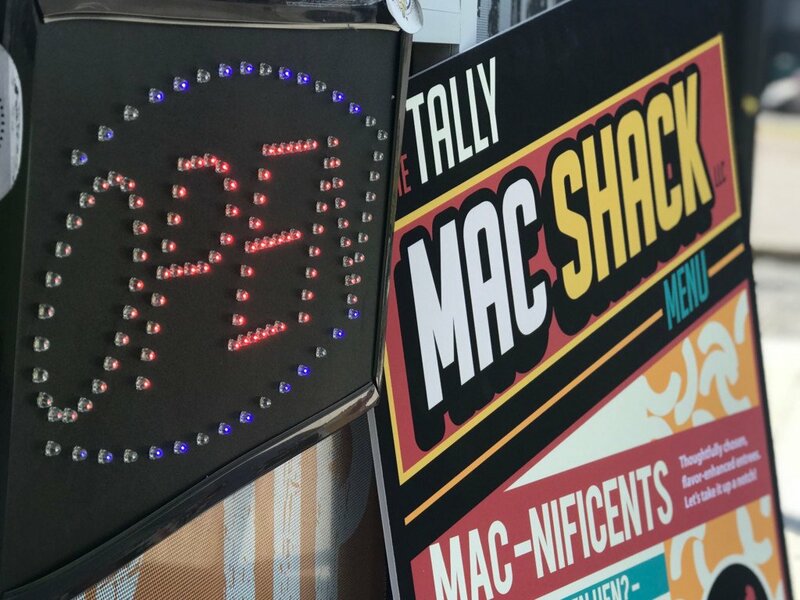 The Tally Mac Shack has been delivering Tallahassee’s best craft macaroni and cheese experience since 2017. With two food trucks and a permanent location now inside Happy Motoring in the Capital City’s SoMo district, the five-time honoree as Tallahassee’s best food truck has captured the hearts of comfort-food lovers throughout the region. Owner and founder Justin Cruz has built a thriving business by combining an innovative twist on a culinary favorite with a generous helping of community involvement and support. The story of Cruz’s meteoric rise from FSU grad student to influential restaurateur began with a decision in 2017 to trade his 2006 Nissan Armada for an old Frito-Lay delivery truck. Even with a graduate degree in criminology and a steady job with a state agency, Cruz jumped at the chance to pursue his entrepreneurial dream. With help from friends and his neighbor, the owner of Kelly Griffin Plumbing, Cruz transformed the weathered gray van into a fully functioning food truck while still parked in his driveway. He then hired local street artists from the BAET Collective to brand it with the initial logo, took some photos and began to build a following. His timing was perfect as his launch coincided with a burgeoning Tallahassee craft beer scene that included the opening of several local breweries. Great service certainly helps, but it is the food that keeps people coming back. The Tally Mac Shack serves a wide variety of macaroni and cheese dishes that draw from people’s best memories of the traditional comfort food while appealing to their more sophisticated, grown-up tastes. With fun names and unique flavor combinations, customers can choose everything from the simple Praise Cheesus, featuring a blend of yellow mild cheddar, American, mozzarella and provolone cheeses, to the What’s Mac Hen Hen, a roasted lemon pepper Cornish game hen on a bed of cracked pepper, blended Vermont white cheddar and asiago mac and cheese. Having built a successful food truck business, Cruz felt that opening a brick-and-mortar location was an important next step. “Our food trucks allow us to participate in community events, deliver our menu directly to companies and organizations across town and partner with the region’s outstanding breweries,” he said. “These are valuable partnerships that we plan to continue and grow. Cruz said that partnering with the popular Happy Motoring placed his restaurant in the middle of an important and proven demographic of mac and cheese lovers. The SoMo district serves young professionals, older students, the Capitol district and visitors to Cascades Park, many of whom have eaten at a Tally Mac Shack truck around town. It also provides a hub to get even more involved in the community. In the 18 months since it was founded, Tally Mac Shack has partnered with local agencies and organizations to support a variety of needs including Hurricane Michael relief and the Down Syndrome Association of Florida. For these efforts, it was named an inaugural winner of the “All in Tally Award,” joining 11 other local business that have gone “above and beyond to make our community a better place to live.” The awards were presented by Leon County Sheriff Walt McNeil and Capital City Youth Services President and CEO Kevin Priest. Cruz and his team have also supported Tallahassee Memorial Healthcare Cancer Center, Fort Braden Middle School, the Kearney Center and others.